In light of all the hell Clipper is going through, from thousands of angry WageWorks customers not getting their e-passes in time, to Clipper & MTC's public relations crew cleaning up the mess; I'm going to give you ways get your passes and e-cash funds to work every time. I've had issues with automatic loading, from being added late to just that funny feeling in my stomach that something is going to go wrong. So, I decided to just go to other ways of adding my passes and e-cash with the feeling of instant satisfaction. Once the people lose the trust in automatic loading (whether it be a glitch or fighting between two agencies), they want to find ways that adding value is available instantly on the card. Are you able to change your orders? Certain companies lets you do this over the phone or online. If you cannot make a change to your order yourself, ask your employer (sometimes the HR office) if there are other options you can take other than automatic loading of Clipper e-cash or passes. Mail order paper passes, that is, if you still can. Good old paper passes are familiar to drivers and fare inspectors. Just be careful of deadline dates the transit agencies set for elimination of paper passes. Commuter paper vouchers is an easy option; they arrive in the mail about ten days before the new month starts, and you just claim them at most Clipper in-person locations like a local Walgreens. Since the vendor add value machines can add value and passes instantly w/out delay, it also includes a receipt as immediate proof that your passes and/or e-cash was added. If you order a monthly pass days before the new month starts, the pass information is held in the card until the first day of the month when it is activated. Commuter benefit debit cards is another option if you frequent locations where automated add value machines are located (e.g. all Muni metro stations, Golden Gate Ferry terminal, and Temporary Transbay Terminal). Automated add value machines are just like in-person vendors where adding passes and e-cash is added immediately to the card without the 72-hour delay (or some wild glitch happening again like earlier this month). For Commuter check users, value is added to your personalized debit card about 10-15 days prior to the new month. Warning! Clipper's policy on all debit cards is there is a $2 temporary authorization check for every purchase; the commuter debit card must have at least an extra $2 on it to successfully purchase a pass or e-cash (example: $60 pass must have $62 on card). You'll get the $2 refunded as soon as the payment clears. UPDATE: The new Muni ticketing machines at all metro stations can issue new Clipper cards for no charge as long as you add a minimum of $2 or buy any pass. If you have an existing Clipper card, you can use these machines to buy passes for all agencies participating in Clipper, and/or add e-cash. These machines still accept cash, credit, debit, and commuter benefit debit cards. But... it will also accept coins too. The old Clipper add value machines have been deactivated and removed from metro stations so they can be installed at Caltrain stations. BART stations should eventually be able to add Clipper card value sometime in early 2011. UPDATE #2: Commuter benefit debit cards can't be used at most in-person locations such as Walgreens or your favorite local grocery store. The rules are very strict and complex (refer to Commuter Check Card's website). If you don't want to get into trouble, only use the card on automated machines, transit agency ticketing offices, online, or train station ticket vendors like "My Transit Plus" at BART stations. Automatic transfer of funds from the commuter benefits company to Clipper. In-person vendor: Cash, and sometimes checks and credit cards. Automated machines: Cash, debit, and credit cards. Lastly, with the influx of thousands of new cardholders and over two million transactions per month (as per KPIX), there is the potential risk that someone can skim your card's data and rip-off your account. Clipper cards don't have magnetic stripes that can be ripped-off by a tampered ATM machine, they use RFID technology and criminals can use off the shelf devices to steal your data from a distance (that's right, picking pockets has turned 21st century). I found a company called Identity Stronghold that sells RFID resistant sleeves, wallets, and badge holders. I bought a badge holder that can protect or dramatically reduce the risk of my card being skimmed from thieves, but I can easily let a Clipper reader scan it by squeezing the top of the holder to allow the card to be read for that brief moment. With shipping, it was less than $15, but a small investment to prevent spending hours of hell with customer service and losing a lot of money. I can't guarantee it will work. I tried the badge holder with my work's proximity card (a really old system in place for nearly a decade) and it was able to read it, but it had to be within half an inch from the reader. Removing the card or squeezing the tabs increased the range to five inches. If I buy a Muni A pass ahead of time, say 5 days before the next month, will it still work on BART the remainder of the month and the first 3 days of the next month or are they still charging cash fare? From my understanding of the rules: It's supposed to work just like paper passes. If you have a new pass for the first three days of the new month, it should work fine on your Clipper card. Is this a recent fix? I recall you wrote something about how A passes don't work on BART the first 3 days of each month. The story you were talking about is one of my readers writing to me about the problem. 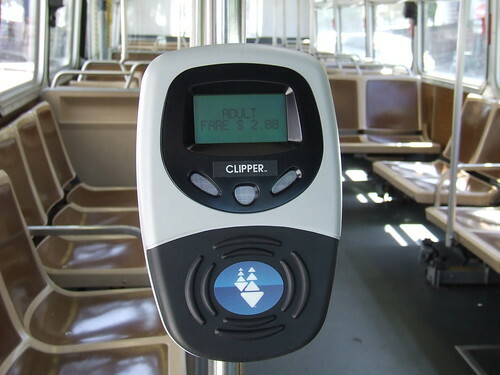 Clipper's rules are supposed to exactly mimic Muni's rules about passes and access to BART. If it does not meet the standards, people are supposed to be held responsible for failure to fix the problem. It's the best answer I can provide you. hi I was wondering if you can link the RFID shield that you have so others can get it. But there's plenty others as well. We do appreciate your feedback and this is an issue that is in the process of being corrected. In the meantime we do apologize for the inconvenience. I will forward your e-mail to my supervisors so they may see your feedback as well. Anonymous - If you have a choice, I would recommend sticking with the paper Fastpass until they have fixed the problem to avoid the possibility of having to pay to use BART the first few days of each month. I have no choice since Clipper is the only option available to me from my employer via Wageworks. The reason that badgeholder didn't work on your old work id card is because the old card works at a much lower frequency. 125khz. The transit pass, US Passports, and new credit cards all work on 13.56Mhz which is what Identity Stronghold products block. Clipper will begin billing a $2.00 service administration charge for all Clipper Card orders beginning with the March 2011 benefit month. This charge will automatically be assessed to your March benefit order and will be charged monthly for every successful load of your Clipper Card. Alternative products are available including the Commuter Check Voucher for Transit. If you no longer want to have your Clipper Card loaded directly please make sure to delete all Clipper specific transit products from your shopping cart and choose an alternative product. Should you have any questions, please contact your Benefits Administrator. Wow. I use CCD and that's a new one for me. Anyway, I prefer a debit card because it's flexible for me to switch from a monthly pass to e-cash. For example, I'd convert the debit funds to e-cash if I were to take a two week vacation during a month.